Shop Smart offer: 5% discount on all standard products. Check in shop for any other special offers. Colourschemer Interiors is Surrey and West Sussex's leading Interior Design and soft furnishing specialist with extensive showrooms in Caterham and Haywards Heath. Our independence allows us to source the very best products from the leading suppliers in each field of interiors. Offering exclusivity and quality of design, we constantly and consistently offer the very best products available in the ever evolving world of Interior Design. We have an outstanding choice of fabrics, wallpapers, lighting & trimmings alongside accessories, blinds, furniture, poles and carpets. Supplying quality, bespoke, hand finished furnishings to primarily domestic clients, we take pride in our products and provide an unrivalled personal service from design through to professional, guaranteed installation. 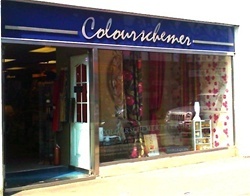 Having enjoyed trading as Colourschemer Interiors for over 33 years, the family owned and run business is headed by directors Alan, Lesley and son Steve Thoma, with youngest son Jordan recently joining the team to head the refurbishment of the Caterham showrooms.